How to Ship and Crate Large Art Pieces? While it may not be a big hassle to ship and crate small paintings, prints, and photos, at least for those who have already done it before, to ship large and heavy art pieces is always a challenge. First of all, large crates are difficult to build and hard to carry. Secondly, even though oversized artworks seem strong and durable, they are usually highly vulnerable to damage. 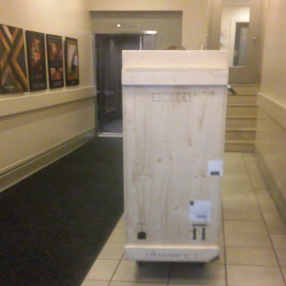 So the question is, how to ship and crate large art pieces so that they arrive at the destination intact? There is only one right answer to this question: you need to hire experienced art shippers for this job! As one of the best art moving companies providing a full range of fine art shipping services in NYC and beyond, Fine Art Shippers specializes in handling art and antiques of any kind, including items that are oversized, extremely fragile, highly valuable, and uniquely shaped. For today, we provide professional shipping and freight services to collectors, antique and fine art dealers, auction houses, galleries, museums, designers, and individuals from around the world. Moreover, our team can ship and crate absolutely any item, no matter its weight and size, which makes Fine Art Shippers an excellent choice if you need to relocate an outdoor sculpture or any other art object that is too large or valuable for standard carriers. For example, in the video below, you can see us moving a life-size, heavy crate from Shapiro Auctions, one of the best auction houses in New York and our valued partner. Fine Art Shippers offers a full range of art packing and crating services to meet the needs of the art community and private clients wishing to protect their precious possessions in transit. We can ship and crate paintings, sculptures, statues, figurines, multi-media works, and whole art collections of any size and weight. Besides, in addition to our in-house packing and crating services, we also provide unpacking, installation, and crate disposal services to commercial and residential clients all over the United States, not to mention that we offer white glove art delivery and courier services across the country. So if you are looking for the best way to ship and crate your art, Fine Art Shippers is the right place to come for help! We will ensure that every single piece of your collection arrives at the destination safe and sound!